There is the sweltering heat and then there is holi. 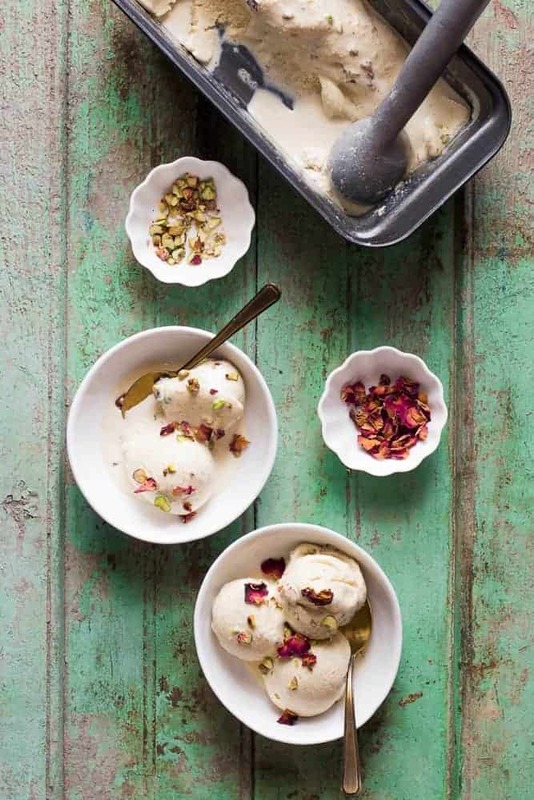 This thandai ice cream will help you with both. Ha. I’m talking creamy spoonfuls of cold ice cream when you take a break from rubbing colors, eggs, mud or whatever catches your fancy, on your friends. Because it’s the season to get dirtaaaaaaaay! I haven’t played Holi in years to be honest. Neither have I had bhang thandai in a while. Because Denver isn’t too fond of the festival and doesn’t understand why people would want to rub colours on each other and then spend hours washing them off. He’s going to hate me for telling you this but there are no secrets between you and me. I’m hoping to change all that this year. I’ve a bunch of super enthusiastic friends who are already making plans. And this thandai ice cream has to make it to the partaaay! Before this, I’ve always had store bought thandai syrup and had no idea making thandai masala powder at home was so damn easy! It’s just a simple blend of spices. Takes about 5 minutes from start to finish if you have all the ingredients at hand, and you are ready to go. You can always use store bought thandai powder, but I will not recommend using the syrup because it’ll make everything too sweet. The base of this ice cream recipe is just cream and condensed milk, and it’s a simple proportion of 2:1. Pretty easy to remember if you want to try different flavors. There are no eggs in this recipe so strictly vegetarian, and it doesn’t even need an ice cream maker. Simple enough? Which is why this made it to the blog. I just finished an entire bowl, without the bhang of course. But the holi version…I’m not telling! 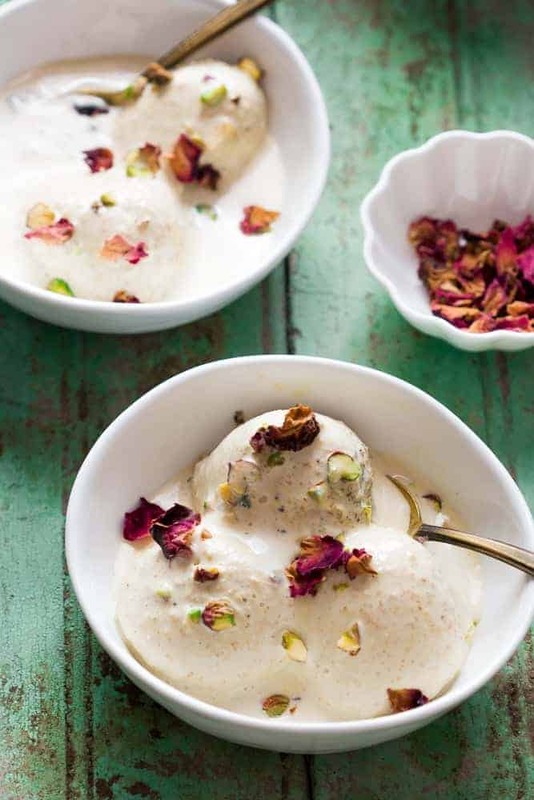 Easy thandai ice cream recipe for the perfect holi party! 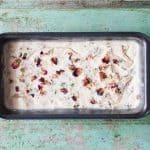 No churn, eggless and does not need an ice cream maker. Includes recipe to make thandai powder at home too. If making thandai masala on your own, grind together all the ingredients listed under thandai masala to a smooth powder. In a pan, add half the heavy cream, milk and 2 tablespoons thandai masala. Gently bring it to a simmer. Simmer for 5-7 minutes. Set aside to cool. Once cool to touch, add rest of the cream and condensed milk. Use a hand blender to whisk for 5 minutes till light and creamy. 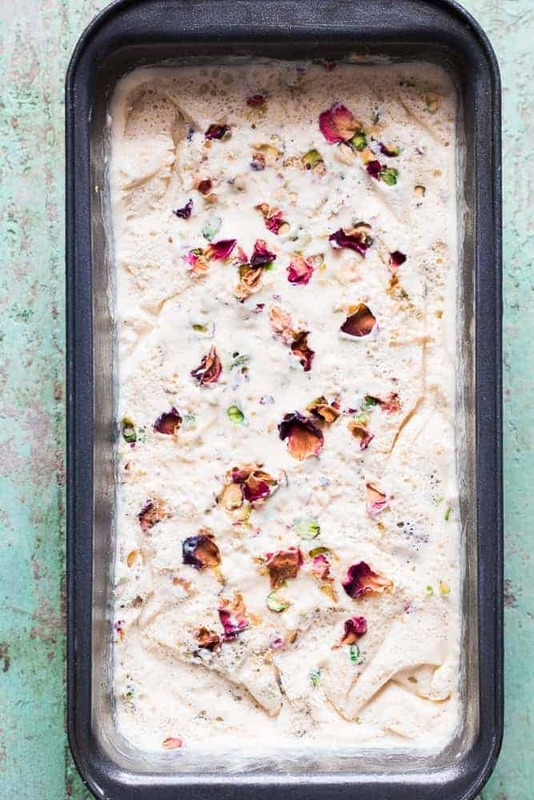 Mix in pistachios and rose petals if using. Pour the mixture into a freezer proof container and freeze for at least 8 hours or overnight. Top with more pistachios before serving. Lovely recipe! When you say Heavy Cream, which cream do you mean? is it standard Amul cream with 25% fat? It’d be best to get Amul whipping cream because that doubles up in volume, but if you don’t find it, standard Amul Cream works. Nidhi thanks for the lovely comment, and thanks for stopping by! Richa this looks brilliant. The food, the photography & your taste for good kitchenware. You should have your own damn TV show! You are killing me Richa.. I can imagine all the flavours here and it looks so creamy.